Hello again! I know... I know... Ako na ang maraming oras para magblog today! hehe Well, I am stuck in the hotel here in the northern part of Luzon until Friday so I got all the time in the world to update this blog. I was honestly never a fan of Belo Essentials products until I tried their Sunexpert line. I discovered their sunscreen (for the face) years ago and I am amazed/completely blown away ng bonggang bongga. Their Sunexpert line is one of the best in the local market. Recently, they launched their Belo Acne Pro and Intensive Whitening Bar. My skin is dry and very sensitive. My younger sister and brother's skin are the opposite. They have oily and acne prone skin. I have been prodding them to use different kinds of skin care products then these goodies landed on my doorstep. I was really excited to let them try the Belo Acne Pro in particular because Sophie Uy swears by it and she compared the toner (acetone daw sabi ni fiance haha) to Mario Badescu's. Little did I know that I will also be loving this new line from Belo Essentials despite having dry and sensitive skin. 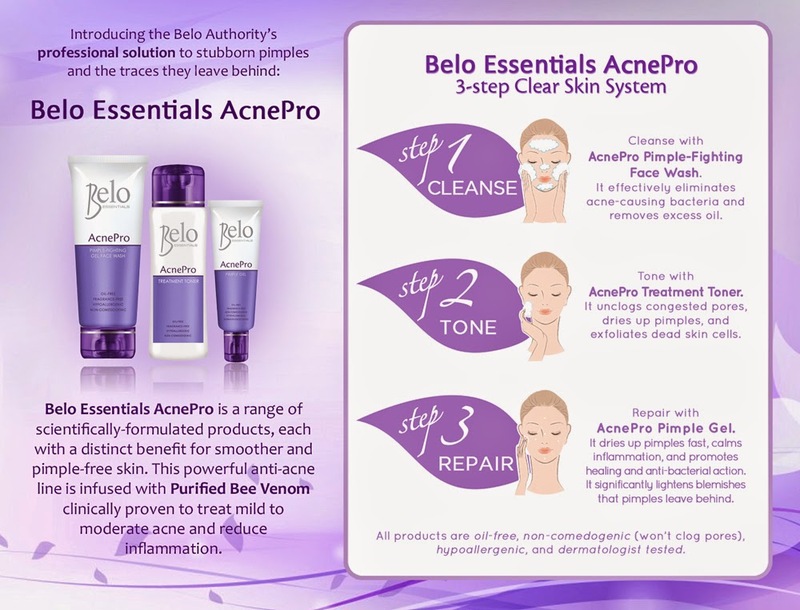 The Belo Essentials Acne Pro Line contains Purified Bee Venom which is very popular in Korea. Purified Bee Venom is a popular anti aging ingredient . It is also clinically proven to have anti inflammatory and anti-bacterial properties. In general, I love the line. I know that I only get zits once in a blue moon but this line has been keeping my chin clear from pimples. Also, my siblings love it! I know I should have posted a before and after of their skin so you would see the difference but I only got the after photo which is quite useless because there is no point of comparison. I know some beauty bloggers are uncertain about this product because it does not lather very well compared to other facial wash. My dry and sensitive skin, on the other hand, love it so much. It comes in a clear gel which is unscented. This reminds me of how cetaphil works on my skin but I feel that this facial wash cleanses my skin better. It does not dry out my skin and gives leaves my skin soft and supple after every wash. I use this every other day to prevent break outs and as of now, I am pimple free. I remember my high school and college days when I was in search for an acne gel and my face would always end up with dark spots whenever I would use them. Yes. Those acne clearing gels that easily burned up my skin and left dark marks were my bestfriends errr frenemies before. This Acne Pimple Gel is comparable to the ones I have tried before but the best thing about it -- it does not leave dark marks on my face. I used it on my stubborn pimple on my chin and it dried up my pimple after 4 days of use sans the peklat!! panalo! However, it does sting abit (tolerable naman as in pramis.. keribells nga ng younger sister ko eh) and it makes my pimple itch too. Out of the three products from this line, my ultimate fave is the toner. I love how it leaves my skin fresh and clean every time I use it. For its price, I would not even think twice of repurchasing this product. Also, this toner did not dry my skin nor caused me any rashes. An organic compound that effectively inhibits the production of tyrosinase and melanin, giving skin a visibly lighter appearance. A peptide proven to inhibit inflammation and melanin formation. It is ideal for stubborn dark spots that do not respond to other skin lightening ingredients. I was honestly hesitant in trying this one. I had a not-so-nice experience with kojic acid soap before because it made my skin too dry and tight to the point of stimulating my psoriasis to flare up. After a while, I intentionally stopped using whitening products and got stuck with polytar, oilatum and dove. However, I noticed my arms got way darker than the rest of my body (especially now! jusmiyo!) Anyways, I was really surprised on how this product worked on my skin. It does not dry out my sensitive skin. My only problem-- it melts easily and compared to other papaya and kojic soaps, this one is slightly slimmer and smaller. The scent is comparable to other kojic soaps. Overall, if there is one whitening soap I would like to use for a long period of time to see if it really works, I would have to say "Eureka!" Alcohol free po ba un toner? Sana un face wash may soap type..para sa pimples sa back..hehe! Sayang kasi pag face wash ginamit sa back..
Actually, merong availabe na acnepro soap. It's best for body acne. Gusto ko yung Acne Pro line! Might try the toner. Fave ko kasi yung sa Snoe kaso mahal P249 for a tiny bottle. Sana mag work si Belo. Like you, I LOVE the SunExpert Face Cover (super legit nya na sunblock!) and the Intensive Whitening Bar. Tayo na ang fans ng Belo. Haha! Pwede po bang gamitin at the same time yung dalawang product? Hi ask ko lang po if pwede after acnepro bar gamitin then acnepro facial wash ng sabay? or isa lang sa knila dpat? I've been reading good reviews about this product so I bought already for my niece. She really loves Belo products.